Richard Vega, seated, waits patiently for his iPad on Saturday in Holyoke, Mass. Richard Vega had pre-ordered his iPad last month. But when Apple’s new device officially went on sale Saturday, there was no question where he would be—in line at the Apple Store in Holyoke, Mass., to pick up his brand new iPad. “I had it reserved, but I wanted to have the experience of just being here,” said Vega, who was rewarded for showing up at 5 a.m. Saturday with being first in line at this western Massachusetts store. That scene played out in cities across the country Saturday, as the iPad became available at Apple Stores, Best Buy outlets, and Apple-authorized resellers. After months of hype that kicked off when Steve Jobs first unveiled the tablet back in January, customers could finally get their hands on the Wi-Fi version of the device, which comes in 16, 32, and 64GB capacities and starts at $499. 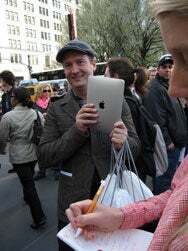 The manager of the Apple Store in Holyoke, Mass., shows off the iPad to customers waiting in line Saturday. In addition to the Wi-Fi models available Saturday, iPads with 3G connectivity will go later this month, and and will cost from $629 to $829. AT&T will provide no-contract 3G service , with a 250MB data plan costing $14.99 per month, and an unlimited plan costing $29.99. International deals for 3G services should be in place by June or July, Apple has said. 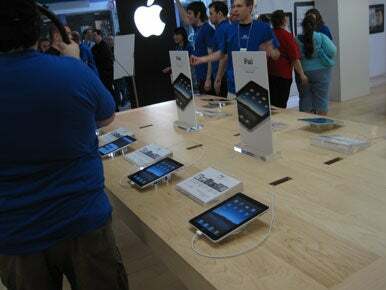 The iPad should be available worldwide by April, Jobs said during the device’s launch event in late January. In New York, a crowd of nearly 1000 people mobbed Apple’s flagship store on Fifth Avenue, though members of the press made up a good chunk of the people waiting outside for the 9 a.m. opening. Reporters flocked around those in the front of the line, pointing cameras and microphones at the tired Apple fans, some of whom soaked up the attention while others were visibly annoyed. 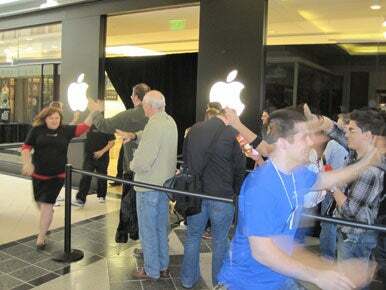 Ten seconds before the store opened, Apple employees led the crowd in an enthusiastic New Years-style countdown. As soon as the doors opened, the first customers walked down the Fifth Avenue outlet’s spiral staircase as dozens of Apple Store employees cheered enthusiastically. Many of the customers were videotaping their descent down the staircase, embracing the moment. The first customer inside the store was Richard Gutjahr, a 37-year-old from Munich, Germany. “It’s changing the way media will be possible,” he said of the new device. Gutjahr said he showed up at the store around noon on Friday. “I spent the night here. It was cold, but it was okay”. Jacob Anenoft celebrates after picking up his iPad at Apple’s store on Fifth Avenue in New York. “I’m in brand heaven right now”, said Jacob Anenoft, 37, who works in IT. When asked to show off some of the iPad’s features, he held up his iPad to reveal a blank screen with nothing more than an iTunes logo. “I need to connect it to iTunes first, so I need to go home very soon,” he said. Across the state in Buffalo, the scene repeated itself, though on a much smaller scale. As early as 6 a.m., two small lines of about 50 people (one for those who had reserved their iPads through Apple’s online store and another one for those in standby) had already formed outside the Apple Store at the Walden Galleria. Every window was dressed up with either large ads for the iPad or drapes over displays that, according a store employee, were not to be unveiled until shortly before the device’s official launch. By 9 a.m., the line had grown into the hundreds, stretching all the way to the end of the store’s block and around the corner. Meanwhile, helpful store employees were continuously scouring the lines, ensuring that everyone was in the right place, checked in, comfortable and well hydrated—as well as, of course, showing off some of the accessories that were going to be available for purchase later. Inside the store, Apple had set up a quick activation service to get iPads up and running via iTunes, as well as a personalized “one-on-one” set up, in addition to several workshops through the day. The iPad was in its full glory inside the Apple Store at Buffalo’s Walden Galleria. Apple Store employees in Buffalo helped fire up the crowd as the iPad launch grew closer. While customers on the east coast bought iPads, west coast buyers were still standing in line. 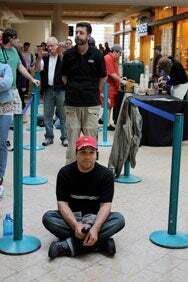 At the downtown San Francisco Apple Store, Alaa Ismail was second in line. Ismail, who was in town on business from Kuwait, had been in line since 9:30 p.m. Friday. "I reserved my iPad online, but it’s not only about getting a product," said Ismail. "It’s the experience, meeting with fans and talking. We call it ‘iWaiting.'" Not far behind Ismail was Boris Louboff, fifth in line. Louboff, who had been in line since 11:30 p.m. Friday, bought two iPads. “I’m going to sell the other one to someone, probably on Ebay,” said Louboff, who plans to take his iPad to France at the end of the month. "In France [Apple] is not as big as it is here, but it’s getting to be very popular." The iPad release at the San Francisco store was a bonding experience for Tracy Kahney and her nine-year-old son, Lyle. It was hard to miss Lyle standing in line—he wore a cardboard cutout suit of an iPad. “He was into it. I have four other kids, but he was into it," said mother Kahey. "He’s been waiting to play [a] flying game. I’m excited about sorting out pictures. We’re all just super excited." Some like Yopp weren't comfortable with the store staff's enthusiasm, but people in line all agreed that the iPad is the start of something big. “I’m believing what some folks are saying—that this will change the way we use portable media," said iPad shopper John Dee Fair. "This is the next step in portable computing and it’ll change the way we interact with the media. It is very personal and powerful and fast." With the iPad, users will be able to connect to Apple’s iTunes stores to purchase music, movies and TV shows. Close to 8500 movies will be available for the iPad, including more than 2500 in high definition, said Brian Marshall, an analyst at Broadpoint Amtech this week. More than 55,000 TV show episodes will be available and CBS and ABC will stream shows to the iPad. Apple is also entering the book and news distribution business with the device. The company is introducing the iBooks application in the App Store for users to browse and buy e-books. Top book publishers including HarperCollins, Simon & Schuster, Penguin Group and Macmillan will make e-books available through the store. Electronic textbooks will be available from McGraw-Hill, Houghton Mifflin, Pearson and Kaplan. Publishers such as The New York Times, the Wall Street Journal, and Associated Press have already come out with news apps for the new device. Thousands of applications written for the iPad are already available through App Store. Some notable companies introducing iPad applications include Ebay, Cisco, Netflix and Nuance Communications. Games will be available from companies like Electronic Arts. Updated 1:50 p.m. with quotes and details from the San Francisco store. Updated at 2:05 p.m. with more background on the iPad.